Isaac Albéniz wrote Iberia as a set of twelve piano pieces, grouped into four "books" of three pieces each. Almost two decades after his death, the violinist and composer Enrique Arbos orchestrated five pieces -- all three from Book One, along with Triana from Book Two and El Albaicin from Book Three -- and this was the version generally favoured on vinyl. Still later, in the 1950s, noted composer Carlos Surinach, at the request of Albéniz's heirs, orchestrated the remaining movements, in a more "open" but still effective style. Jean Morel recorded the full hybrid version in the early days of stereo (RCA, 2 LPs), but, at least Stateside, his album didn't stay in print long. Much later, Jesús López-Cobos recorded it digitally (Telarc), and it still had to be spread over two short CDs. It's always good to have Ormandy's monaural CBS recordings restored to print, especially when, as here, the conductor didn't redo these pieces for stereo. As a longtime fan, I'm always pleased to hear his orchestra's lush yet firm string sound, bold brass choir, and elegant solo woodwinds, and the performances are full of character. The opening Evocación is sprightly, and the English-horn solo is sinuously lyrical. The start of Triana is lovely and delicate; later, the attack on the massed strings is forthright. El Albaicin begins with some sense of mystery, with punctuating episodes bringing a sparkle. Book Four is particularly impressive. Málaga goes with dynamic energy, Jerez with rhythmic point; a combination of propulsion and tonal weight brings Eritana, and the cycle as a whole, to a splashy finish. At times, the conductor's no-nonsense manner feels out of sync with the music's aesthetic. Thus, El Puerto is lively -- the dance rhythms here as elsewhere strongly marked -- yet the quieter closing pages somehow don't feel any lighter: the sonority remains dense. The full sounds, on the other hand, cushion and temper the complex, forward-looking writing of Rondena. Similarly, there are passages -- during the languid woodwind solos in El Corpus en Sevilla and the low-brass theme in Malaga -- where the secondary musical elements get rather busy, though they never actually interfere with the business at hand. 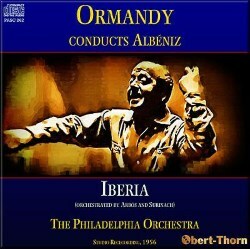 Elsewhere, notably in El Polo and Lavapiés, Ormandy organizes the sonorities clearly for brilliant, focused results. As for the sound, no doubt restoration engineer Mark Obert-Thorn did the best he could with the source material -- he always does -- but, alongside the companion release of Sibelius tone poems (Pristine Audio PASC 205), the results here are disappointing. There's a comparative lack of depth, as would also be the case with much of CBS's stereo output. An aggressive treble in tutti shortchanges the glamour at the climax of El Albaicin, and makes for dry high violins in Málaga. The high woodwinds in Jerez are overinsistent; there's even a hint of breakup in the big snare-drum-laden climax of El Corpus en Sevilla. Mind, the sound is always listenable, but comparatively "canned": it won't fool you into thinking it's stereo, as the Sibelius could. None of the recordings I've mentioned earns a clear recommendation. I like Morel's spirited version, and RCA's sound is lively, but the Paris Conservatoire Orchestra is occasionally stiff and awkward. Telarc's Cincinnati Symphony is more polished, and given a handsome production, but the performance has its becalmed passages. Ormandy's has its musical and technical drawbacks as noted, but it is well played, and quicker tempos allow it to fit on a single CD. It's your choice.